Week 6 was a lot of fun, but a lot of driving and a lot of games. With Carrick cancelling the rest of their season due to low numbers, I was on the hunt for another Thursday game. Which led me to search the surrounding states for games. Parma had a game, and elsewhere in Ohio. And Buffalo had two games. But, as I looked around, I found one in West Virginia. With a 1pm kickoff. Surely, that couldn’t be right. But, the more I investigated, the more I confirmed that yes, there was a game kicking off at 1pm on a Thursday in northern West Virginia. Preston County, home to the Preston Knights in Kingwood, were hosting Hedgesville at 1pm. Why? Because of their annual Buckwheat Festival in town. With classes letting out shortly before kickoff and Friday being closed, meant the game was kicking off early as part of the festivities. Unfortunately, Preston was not good. Only four wins in the past three seasons not good. The game kicked off under a light rain before a small, wet crowd. The ground quickly became saturated and near the end of the first quarter, Hedgesville tacked on two more scores to blow it wide open. After some back and forth with on-field scuffles, Hedgesville set out to score as many points as they could, throwing for the endzone as the first half expired. Failing to extend their already lopsided lead. The second half included a field goal in the third, while the fourth quarter was scoreless. The rain intensified, and the teams just went through the motions to finish things up during the fourth-quarter running clock. Now, one thing strange about Preston, was that the schools were located in their own campus on a hillside south of town. Two fields, one fully turfed with an all-weather track, and another football-only grass field with a wooden stand next to it. Yet, the they turfed the other field with full football lines and left a muddy cesspool for the football team to actually play their games. West Virginia, for those new to the Mountaineer State, operates as the SSAC or WVSSAC, depending on your nomenclature. There’s three classes for the state, with the 90 or so teams split evenly into AAA, AA, and A. Largest to smallest. The top sixteen, by a point system, are bracketed into the playoffs, state-wide. There are no regions or travel considerations. The higher seed hosts throughout the playoffs until the state finals. The “Super Six” are played in Wheeling at Wheeling Island Stadium. The 2A game on Friday night, with the 1A game on Saturday night. Saturday afternoon hosts the 3A big school game. The next day, was a double-header of sorts. The Pittsburgh City League operates as PIAA District 8. A six-team circuit of just Pittsburgh Public School teams. One, USO, is a co-op between University Prep, Science & Tech, and Obama Academy. The other five are Allderdice, Brashear, Carrick, Perry, and Westinghouse. When three league games are scheduled for the same weekend, the use of their only stadium must be finessed a bit. Friday Night, Thursday Night, and when necessary a Friday afternoon game. This is in stark relief compared to when additional schools such as Oliver, Schenley, and Peabody among others still played and you’d see Thursday afternoon game and even Saturday afternoon games. This was one of those weekends, though. Only the second time this season a Friday afternoon game was scheduled. Brashear played visitor to Westinghouse. The Bulls and the Bulldogs. 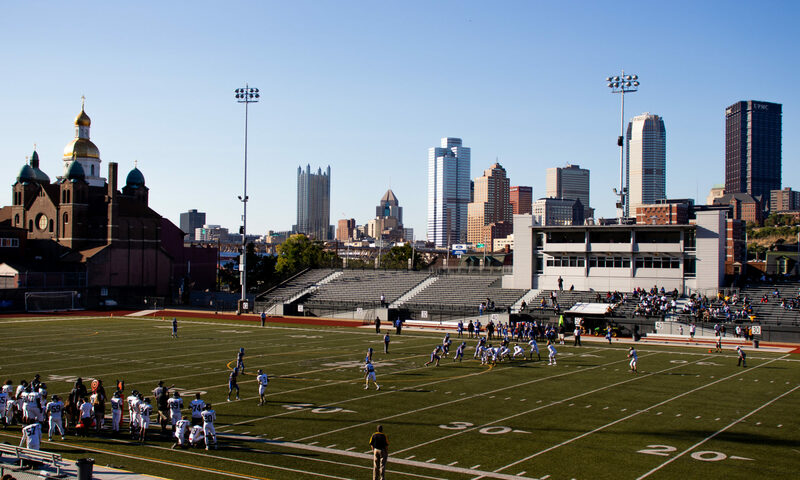 Cupples Stadium, one of the most picturesque stadiums situated on Pittsburgh’s south side along Carson Street, hosts all city league games. A mammoth stadium that sometime swallows up the crowd which usually numbers in the hundreds. The game itself hinged on two key punt snaps. Both by Westinghouse. One fumble was returned for a touchdown. The next for a safety and an ensuing touchdown on the next drive. Westinghouse struggled to move the ball with Brashear starting to open it up. But after Westinghouse started to make it interesting, Brashear connects on a 40-yard field goal through the uprights to make it 27-14. The lead they’d hold until the end. After the game, there were three options and two possible backup games to attend. My friend and I had originally planned to make the short trip south to McMurray to watch Peters Twp host Canon-McMillan. With possible ‘in the event we can’t make it’ to either travel to Baldwin, or just stay at Cupples to cover the night game between USO and Allderdice. But, there was another game. A marquee game taking place roughly 48 minutes away–via google maps–between Elizabeth Forward and Derry. A game we weren’t quite sure we’d be able to make it. Peters Twp kicked off at 7pm. Plenty of time. Elizabeth Forward kicked off at 7pm. But, a battle of unbeatens awaited us in Elizabeth. We arrived just at kickoff and got into the endzone gate just in time. There wasn’t much to say about. Elizabeth Forward and Derry traded first frame touchdowns while the Warriors of Elizabeth Forward broke the game open with three scores in the second to take a commanding, 25-7 lead against a Derry Trojans team that didn’t look capable of moving the ball quickly on offense. Lighting at Warrior Stadium wasn’t really the best. But I made the best of it with some low angle sideline shots. While following updates from around the WPIAL, it looked like we had chosen the wrong game. Canon-McMillan was pulling off the upset against Peters Twp. A surprise that left a 25-7 scoreless third quarter lead by Elizabeth Forward a bit boring. And then Derry figured something out. A 3-yd TD pass with 1:39 to go. Recovering the onside kick led to a 20-yd TD pass with 13 seconds to go. And, again Derry recovered the onside kick. Though no flag was thrown, it appears the call was that it was short of ten yards because the ball was awarded to Elizabeth Forward who ran out the clock of a 25-22 game. The next afternoon, was the start of three games for the day. 1230pm at Western Beaver, 3pm at Moon, and 7:30pm at Beaver. The Ellwood City Wolverines clung to a small halftime lead after a tumultuous first half. Penalties, mistakes, and questionable play calling kept both teams in a near deadlock. Western Beaver struggled, but got a 73-yd TD pass to the left flat to go the distance and sent the game to overtime. Putting a crimp into our midday plans. Western Beaver opened the extra frame by going four-and-out. Ellwood City then went and drove it in on third down to win on a beautiful day in rural western Pennsylvania. The extended fourth quarter and overtime meant getting to Moon for the OLSH-Laurel game wasn’t going to happen on time. Instead, it was late second quarter by the time we made the half hour drive. Not much to say about OLSH’s homecoming game. A 28-7 lead nearly doubled to a 55-13 lead at the final whistle. After a stop at Eat’n’Park, it was on to Game #3 of the day. Beaver hosting their annual homecoming game on Saturday night against Ringgold. In my seventh game watching Beaver, they were looking for their seventh win. All of them on homecoming. Looking at the projections, it was rather certain to be Win #7. Ringgold’s defense struggled to keep it close early on, but Beaver’s offense was on point and took a quick lead that would be enough. Four more touchdowns in the second quarter put to rest any hope of an upset. Two more touchdowns finished off the game. One by each side. Ringgold finally getting on the board in the third quarter. A tough season for the Rams and the Bobcats getting a bit of rest and a chance to work on things as they gear up for the stretch run as a 4A team for the first time. Only 595 miles for the six games this weekend. 344 of those were just heading back and forth to Kingwood, West Virginia with a stop at Hokkaido Seafood Buffet near the Waterfront District by Homestead, PA on the way home. One of the more productive weekends in the books. Year to date: 37 games. 73 different teams. 8 states. Derry and Elizabeth Forward were the 971st and 972nd varsity football teams I've seen play. And Warrior Stadium in Elizabeth (PA) was the 262nd different stadium. And 860 total games lifetime in 36 different states. For photos of this weekend, click HERE.